Our history starts with our big brother company, do it outdoors media. As the owner and operator of the largest national fleet of over 100 mobile billboards, we know promotional vehicles. From our joint offices, I can literally see utility vehicles, sampling vehicles and armored vehicles parked outside. Plus, we have media formats designed for brand ambassadors to use: Segways, JetPacks and sampling bikes. But our fleet is just the beginning of why we are considered a leader when it comes to experiential marketing vehicles. We’ve got the drive. Literally. Leveraging the media formats of do it outdoors means also inheriting their slick operations. From professional, experienced drivers to complete fleet maintenance, our team knows a thing or two about driving a branded experience. We don’t need to pass on additional leasing costs for many of our campaigns, because we already have a fleet of media formats at our disposal. However, if your brand experience calls for a specialty vehicle we don’t yet own, that’s certainly not a barrier for us. Whether we would lease or purchase as a new addition to our fleet, we have established partners on speed-dial who can help us procure and fabricate a vehicle that aligns with your experience needs. All maintenance, insurance and liability would fall to us, keeping your brand protected at every turn of the road. So, how do you select the right experiential marketing vehicle? Whether you’re planning a one-market take-over or need a reliable branded vehicle for your mobile tour, the vehicle you choose can make a big difference. First, consider function. If you’re serving food from it, consider refrigeration, necessary appliances and chef utility space. If you’re turning it into a podcast studio, consider acoustics and connectivity. If you’re hauling swag and samples, storage size and the need for a lift gate may be of the essence. To give your brand ambassadors more mobility to cover a larger area, you may want to think about Segways or bikes. Next, consider size. Not just for the functionality of your experience, but also for the permitted spaces of your activation and the touring route it will be driving. Plus, if you’ll be utilizing warehouses during the tour, you’ll need to note any clearances at those storage facilities. Finally, consider brand authenticity and aesthetics. If you’re an Eco-friendly brand, go electric. If you’re a nostalgic brand, go old-school. How you design the vehicle’s wrap will also help you keep to your brand and offers real estate for the campaign’s messaging and visuals. Depending on the vehicle selection and type of experience, there may be room for creative build-outs. 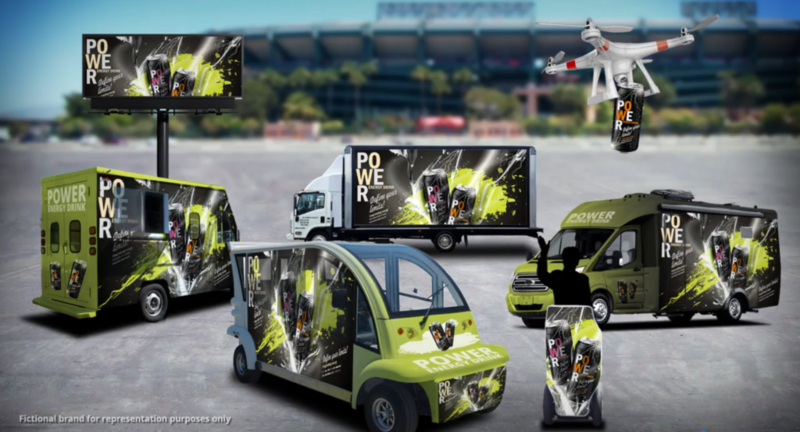 The experiential marketing vehicle provides a visual element to the campaign that can add intrigue and impact. The solution for your brand experience may not be found in one vehicle. Perhaps, it’s better to use a caravan with a variety of vehicles. Maybe you require a tow-behind type trailer for certain events. Fabrication is always an option if you need a customized media format designed to spec. Choosing the right experiential marketing vehicles may be overwhelming. Let us help! This is our specialty, and our team is experienced in sourcing the best marketing fleet for your needs.